Hi Friends, it’s early Monday morning and I’m listening to a fantastic piece called “The Kiss” by Judee Sill. I first heard about her from Anthony Wilson who played an instrumental version of the song on his recent Athenaeum concert in La Jolla. Judee was a 1970’s era folk artist that never really hit it to superstardom but did record a couple of records for Asylum Records. She lived a tragic arc as an artist but left some beautiful music to this world. “The Kiss” is a brilliant piece of music and the feeling that it emits is timeless. Check it out! 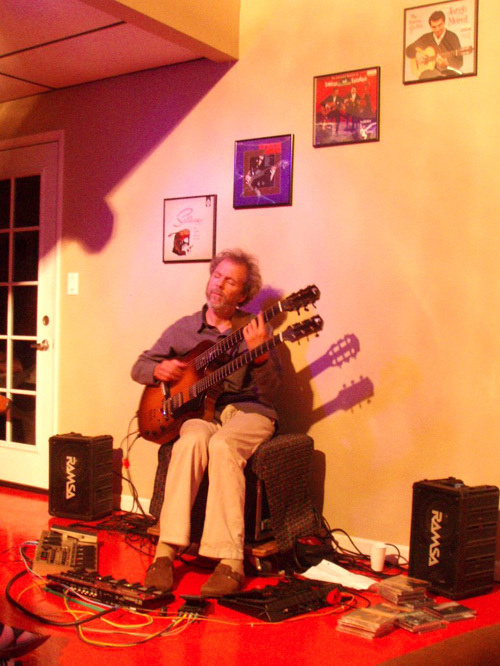 I had a wonderful solo concert at The Paper Moon last night in Point Loma. What a cool little music studio and the vibe and reception was just right. 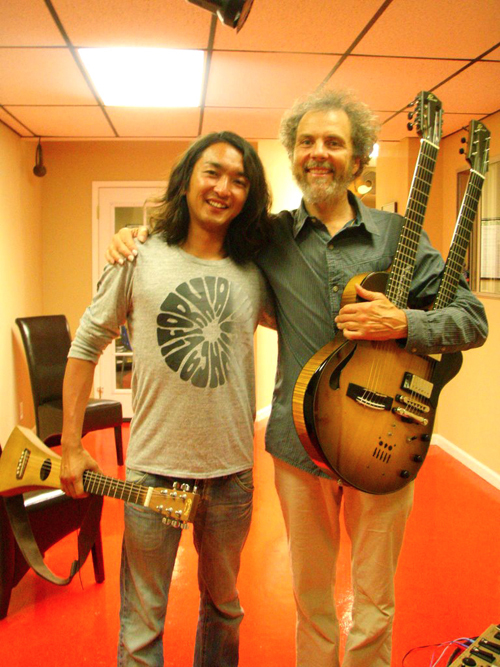 I met a young guitarist from Japan named Yosuke who came to San Diego for the week to surf and it luckily coincided with my concert. He says I must come to Japan to surf and play music. I’m in, where do I sign up? The setting at The Paper Moon. I dig the orange floor and I think it made me play better...Hah! That's Yosuke on the left and me on the right. Cool fellow and he's into the same things as me jazz and surfing. 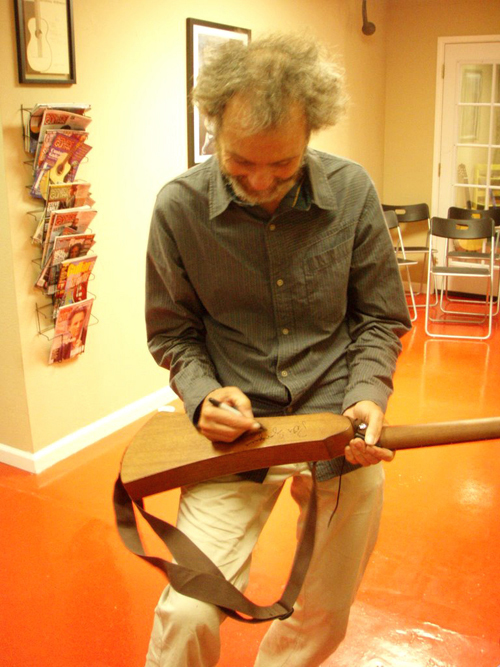 Yosuke had me sign his Martin travel guitar. Crazy! 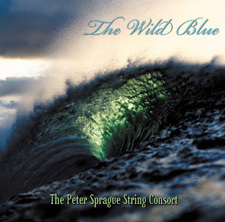 I’ve been getting a lot of requests for the solo guitar arrangement on my song called “Secret Code” that I recorded on my Peter Sprague Plays Solo CD. I finally took an hour and wrote the piece out and now it’s up on my website. Go here for the download. It’s written in both traditional notation and TAB. For this week I’m thrilled to be playing Wednesday evening at the Grant Grill in downtown San Diego with Duncan Moore on drums and Bob Magnusson on bass. I’ve been doing mostly solo and small group gigs lately, all without drums, so it’ll be good to connect with Duncan and Bob and stir up the grooves again. Hope to see you there. Also this week I’m into some summertime Roxy activities. First, Thursday night it’ll be me playing solo and then, on Saturday evening, Kevyn Lettau and I will play in the duo format. Both are good opportunities for a night of music and basking in the flow of California operating at it’s best. Check it out.